It is not a Poisson d’avril (April Fool’s Day, literally in French, April Fish, when the French play hoaxes like in many countries, and act like silly foolish ones, taking great pleasure in sticking paper fish in someone’s back, without he or she noticing). We do those things yes. And I remember my school days when the best was to try to get a teacher you hated and make them look like fools by very skilfully sticking that paper fish on their backs. They would walk around school with the fish on their backs all day. We loved it. But back to my post, despite that I am not playing a hoax on you, an error unfortunately was added to this post, and if you are good, maybe you can find it? Let’s get ready for the ride. While listening to Arthur H, Adieu Tristesse (my favorite at the moment), I am going to tell you a story. PS: If you were thinking of getting the CD for my birthday (no, you are just too nice), I already have it, so no need for it. Thanks anyway. I am a May girl. What does this mean beside the yeah she is a Taurus, stubborn, earthy and elle fonce sans réfléchir (in English this means “she is so sensible and thinks a lot before taking decisions”). Well it means that I love strawberries AND that my birthday’s cake has always been, well most of the time, a strawberry cake. Mum merci!!! Lately, I have seen so many strawberry dishes on the foodosphere-look at Fabienne, Sophie, or Ilva– that I thought, et moi alors? I need my strawberry fix, even if it is not yet my birthday. I am not yet making a cake but since dough is to be often found at my house- and you know this by now-, I can easily make desserts like the following. Roll your dough and make little tartlets. How? Cut four 4 3/4 inches squares (12 cm) in the rolled dough and prick the bottom with a fork. Cut small strips of dough (1/3 inch, 1 cm) to make the edges. Place them on top of the bottom part and seal with some egg wash if you like. Place in the oven for about 15 to 20 mns, or until puffed and golden. Mix together the sugar with the mascarpone cheese and vanilla essence. Place the mascarpone cheese at the bottom of the tart (use a decoration bag if you like) and place the strawberries on top. 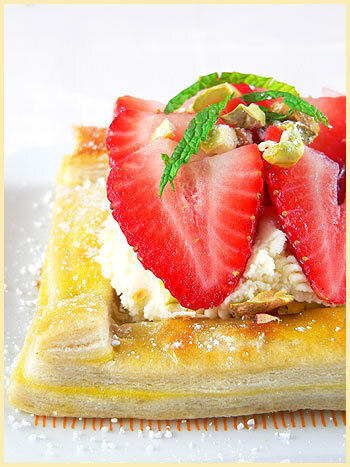 Decorate with mint and chopped pistachios (or place the pistachios on the mascarpone and then add the strawberries on top). How beautiful! I love that these make me thing immediately of spring. 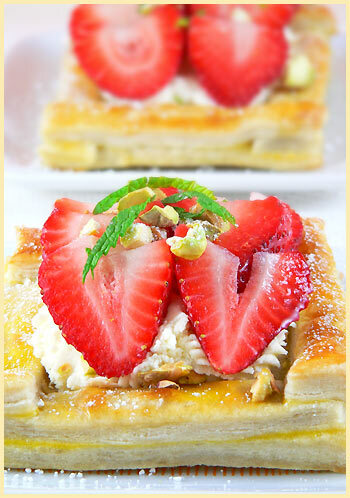 I especially love that I just happen to have some puff pastry left over and some strawberries in the refrigerator! Bea this is so beautiful! You are so talented and really … my daily trip to your blog is pure joy. I also love that I know that your birthday is in May … I will have to remember this! As for the mistake … I’m terrible at these things. And to be honest, the picture just kept drawing me in so I’m afraid I don’t know what it is. It’s ok. I have the gorgeous photo to comfort me! Chouette strawberries, i love strawberries too and your tartlet are beautiful. Gosh, I love this site! You really know how to make food look wonderful. I must buy some puff pastry – you have really inspired me there! à croquer, frais, gouteux, je vais finir par acheter des fraises d’Espagne même si je sais qu’il ne faut pas. With this you are definitely killed me!!! But please…give me a piece of this gorgeous tartellettes!!! I’m going to sleep now!! Hahaha! April Fool’s Day, I quite forgot. In Italy it’s Pesce d’Aprile and YES I love that joke of putting the paper fish on an unsuspecting back! (I think I must’ve made atleast a dozen fishes two years ago and made my husband insane with my rascal behavior). I hid them also in the most craziest places, like under the toilet seat lid and when my husband went to use the bathroom…voila! A practical joker, I am. Very lovely dessert Bea, but, uhm, when is your BIRTHDAY? Don’t tease, we want to know the exact date! It’s me Meeta, your Flickr contact! I actually came to your website to get the recipe of the Mousse au Chocolat. The pics I saw on Flickr turned me on so much, I thought it would be a great birthday present for my hubby! However, now that I see these tartlets I am torn between the two. My hubby is a May baby too, but a Gemini. Beautiful tartlets, funny to think of strawberries in May for me though, as you know it will be a while before I see them again! Thanks J. I am glad you like it! Fabienne, let me know how it goes if you make it. So Catherine, here you are! Your French is pretty up-to-date! You found the puzzle! You deserve a tartelette aux fraises! Ah mais oui Anne, vas-y, personne ne te dira rien si tu triches et que tu achetes des fraises d’Espagne! Sandra, if only they could (the tartlets) travel well! Anita, ah, nice. when is your day then? No wonder I like yours too! Hi Bron, ah yes, very true, the inverted seasons! How is the weather right now around Christchurch? PS Had never heard about the fish on the back joke. You see, you learn other things apart from food when reading foodblogs..
Ooooh I love your site! I found you via Beyond Salmon, and I’m sooo glad I did – your recipes are beautiful… every single dish looks delicious.